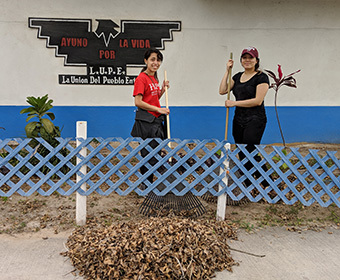 (Jan. 10, 2019) – This week, nine students and two staff members from UTSA are in the Rio Grande Valley, working alongside and learning from La Union Del Pueblo Entero (LUPE), a non-profit and community union rooted in the belief that members of the low-income community have the responsibility and the obligation to organize themselves. UTSA Volunteer Services hosts alternative break experiences each semester focusing on current social needs within central or south Texas. The mission of this trip is to better understand how the lack of immigration reform impacts residents who live along the Texas-Mexico border. For student trip leader, Edgar Garza, a UTSA sophomore majoring in kinesiology, this experience hits close to home. He grew up in Mission, Texas along the border. This week, the students have been learning about immigration reform and immigrant rights, working with Proyecto Azteca to refurbish and construct parts of housing units for low-income residents, volunteering in Colonias, low-income neighborhoods along the border and witnessing and learning about the U.S.-Mexico border wall. The UTSA delegation visited with locals, sharing with them the services that LUPE provides for them such as preparing taxes, how to apply for citizenship, and how to regain lost wages. LUPE is positively impacting the lives of U.S. citizens, legal permanent residents and the undocumented community in ways that holistically uplift the Rio Grande Valley. When the students return to UTSA, they will hold a reflection session to discuss what they learned from the experience. UTSA Volunteer Services, as well as grants from the Family Fund and Transformational Fund, cover the majority of the expenses related to these experiences. The group will be traveling to Puerto Rico in March for Alternative Spring Break to help with hurricane relief. Get engaged with UTSA Volunteer Services.